Clemson Girl: Opportunities gained and opportunities lost. Opportunities gained and opportunities lost. The Clemson Tigers heard all week how they had nothing to play for on Saturday and how NC State was playing for their season. Turns out, the Tigers had everything to play for with Nos. two, four, and five in the BCS standings losing on Saturday. Clemson could have moved up to number three or four and considering they play a top-fifteen South Carolina this week and a top-five Virginia Tech in the ACC Championship Game, they could have played their way into the national championship picture. 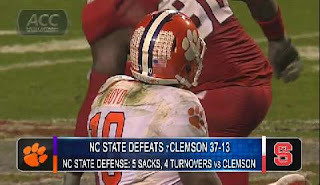 Too bad they played their way out with a 37-13 loss at Carter-Finley Stadium. The Clemson defense played the best first quarter of football they have played since week five against Virginia Tech and then the turnover bug bit the offense again giving the ball to the Pack on the 18-yard line after a Mike Bellamy fumble, the six-yard line after a Tajh Boyd fumble, and the 11-yard line after a 34-yard punt return. When the defense has less than 20 yards to do its job, they probably aren’t going to be very successful, although defensive coordinator Kevin Steele wouldn’t use the short field as an excuse. The offense didn’t have much success against the Pack as quarterback Tajh Boyd was scrambling for his life most of the night. With left tackle Phillip Price out with a knee injury, the Tigers were forced to fill some holes on the offensive line with less experienced guys. And the result was six sacks on Boyd. Offensive coordinator Chad Morris said that the lack of offensive production is completely his fault and he will do whatever it takes to get things corrected. As much as this loss stings for players and fans alike, the opportunities on the horizon are just as big. Clemson has the opportunity to win ten games for the first time in 20 years. The Tigers have the opportunity to prevent their arch-rival, the South Carolina Gamecocks from having their second ten win season in the program’s history. Clemson still has an ACC Championship to play for and an opportunity to win the ACC for the first time since 1990. Clemson has a chance to visit the Orange Bowl for the first time since 1981 and win a BCS bowl for the first time in school history. And most importantly, the Clemson players and staff have the opportunity to prove to the nation and the national media that this is not the same old Clemson and that the Tigers can be relevant on the national stage. Make no mistake, with three games left in the football season; there is EVERYTHING to play for.